Titus Andronicus, a Roman war hero, provokes the wrath of an enemy queen and incites a cycle of revenge killings that leaves countries and families in ruins. It’s an eye for an eye (and then some) in Shakespeare’s most bloody revenge tragedy. Special pay what you can performance on Thursday September 27th! 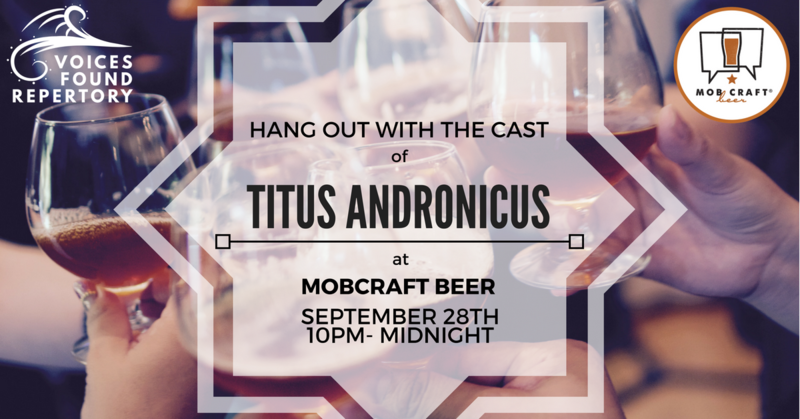 And head over to MobCraft Brewery and Taproom on Friday, September 27th from 10pm-12am after the show to hang out with the cast and support Voices Found Rep.
Tickets are available online and at the Box Office an hour before the show. Pay What You Can not valid online. All donations are greatly appreciated for performances on September 27th!